CD review: "Live and Let Live!" This review first appeared in the March/April 1989 issue of Living Blues magazine. 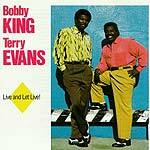 Bobby King and Terry Evans are veteran soul singers who have spent the last few years touring with Ry Cooder's band. "Live and Let Live!" is produced by Cooder, and he and his band provide the backup for Evans' and King's debut as leaders. There is more R&B on this album than pure blues, but the influence of the blues is always present - and the sheer power of the music will convert anyone to King's and Evans' singing. On "Just a Little Bit," Evans' baritone vocals take the lead, while King's tenor provides the imaginative and always changing harmony. Both singers can alternate between unbridled raw emotion and smooth, polished Top-40 stylings within the same song, and exhibit that ability to good effect throughout. King handles the lead on "Bald Head," a broken-hearted love song in a blues vein written by Cooder and pianist Jim Dickinson. The uptempo rhythm seems to suit King well. "Seeing is Believing" suits him even better, as King wrote this piece. The multi-layered, complex rhythms are reminiscent of what Little Feat was doing in its prime. The melody is built around a short, catchy riff, and then improvised over each succeeding verse. King's lead vocal spans the stylistic range, from Top 40 to soul to call-and-response gospel, closing the song with some jazz scatting. The two vocalists shine brightest on Evans' "Let Love Begin," a slow ballad with a minimum of instrumentation. Evans uses his rich-as-fresh-coffee voice to balance King's more experimental approach. Evans tries his hand at acoustic guitar on another of his own songs, the slow blues "Let Me Go Back to the Country." However, while his playing is up to par with his singing, there are several moments where he and Cooder  who is accompanying on electric guitar  seem completely out of sync with one another. Cooder, one of the finest guitarists around, finally gets a few licks in on Evans' title track, and uptempo R&B funk tune. While Evans, King and the band seem more at home on lively, rhythmic songs, the album closes out with a slow Southern gospel-style piece, "At the Dark End of the Street." This song works better than any of the other slow tunes on the album. The warm vocal harmonies and relaxed atmosphere provide a telling ending to a wonderful album.